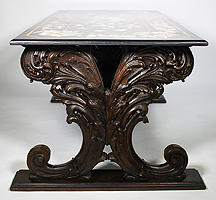 A Fine Large Italian Baroque Carved Walnut Pedestal Table Base with a "Pietra Dura" (Pietre Dure) The Inlaid Marble Figures of Flowers and Birds. 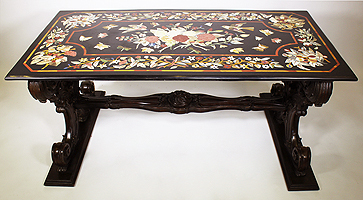 The base is 19th Century, the Pietra Dura top is 20th Century. Pietre Dure is an Italian plural meaning "hard rocks" or hardstones; the singular pietra dura is also encountered in Italian. In Italian, but not in English, the term embraces all gem engraving and hardstone carving, which is the artistic carving of three-dimensional objects in semi-precious stone, normally from a single piece, for example in Chinese jade. The traditional convention in English has been to use the singular pietra dura just to denote multi-colored inlay work. However, in recent years there has been a trend to use pietre dure as a term for the same thing, but not for all of the techniques it covers, in Italian. But the title of a 2008 exhibition at the Metropolitan Museum of Art, New York, Art of the Royal Court: Treasures in Pietre Dure from the Palaces of Europe used the full Italian sense of the term, probably because they thought that it had greater brand recognition. The material on the website speaks of objects such as a vase in lapis lazuli as being examples of "hardstone carving (pietre dure)" The Victoria & Albert Museum in London uses both versions on its website, but uses pietra dura ("A method of inlaying coloured marbles or semi-precious stones into a stone base, often in geometric or flower patterns....") in its "Glossary", which was evidently not consulted by the author of another page, where the reader is told: "Pietre dure (from the Italian 'hard stone') is made from finely sliced coloured stones, precisely matched, to create a pictorial scene or regular design". The English term "Florentine mosaic" is sometimes also encountered, probably developed by the tourist industry. It is distinct from mosaic in that the component stones are mostly much larger and cut to a shape suiting their place in the image, not all of roughly equal size and shape as in mosaic. In pietra dura, the stones are not cemented together with grout, and works in pietra dura are often portable. Nor should it be confused with micromosaics, a form of mosaic using very small tesserae of the same size to create images rather than decorative patterns, for Byzantine icons, and later for panels for setting into furniture and the like. For fixed inlay work on walls, ceilings, and pavements that do not meet the definition for mosaic, the terms intarsia or cosmati work/cosmatesque are better used. Similarly, for works that use larger pieces of stone (or tile), opus sectile may be used. 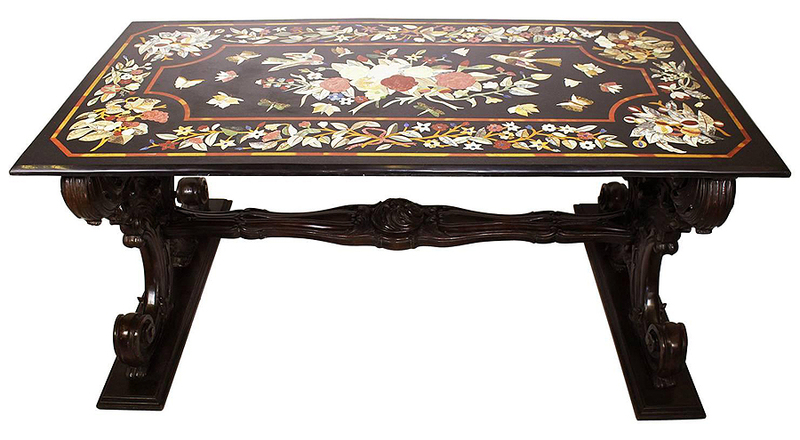 Pietre dure is essentially stone marquetry. 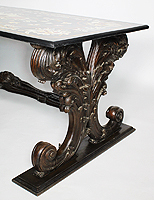 As a high expression of lapidary art, it is closely related to the jewelers art. It can also be seen as a branch of sculpture as three-dimensionality can be achieved, as with a bas relief.